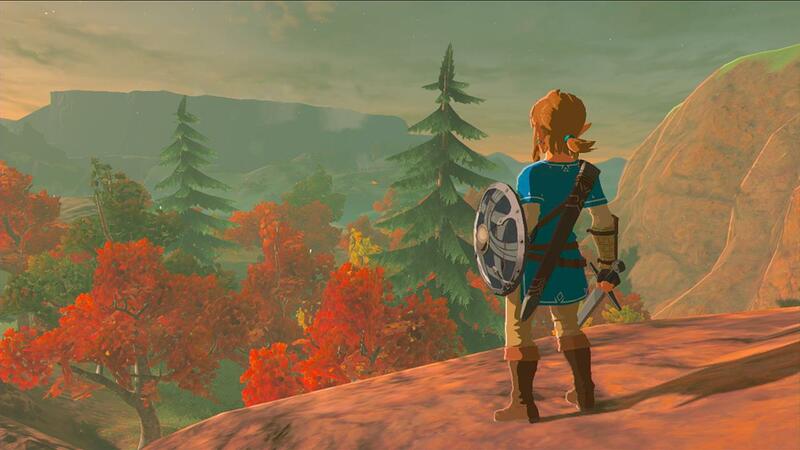 In whatever down time I’ve had the last three days, put a lot of thought about doing a review for The Legend of Zelda: Breath of the Wild. The one thing that has given me the most pause is figuring out just how to begin. 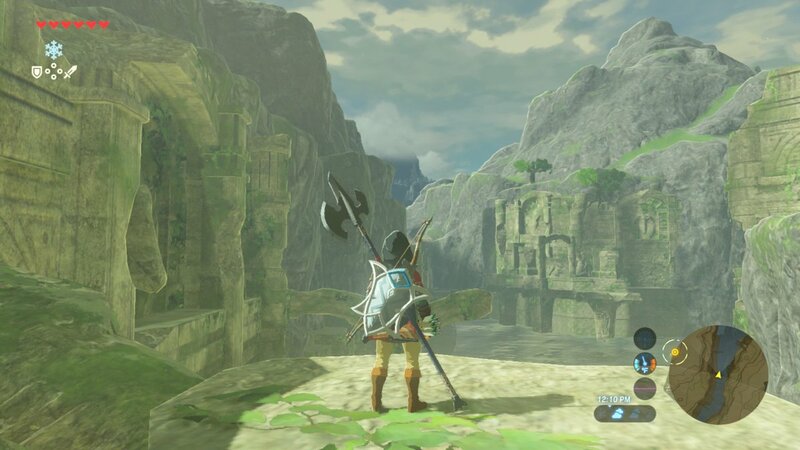 English professors always like to say “Start with your thesis,” so I’ll just do that: there’s a good chance Breath of the Wild is the greatest video game I have ever played. What makes it great, then? Some great games are amalgamations of other great games that came before them. Rarer are the kinds of great games that get things taken from them. The kind of games that shift the paradigms of the entire industry and stand as a benchmark in design. The kind of games that change things. 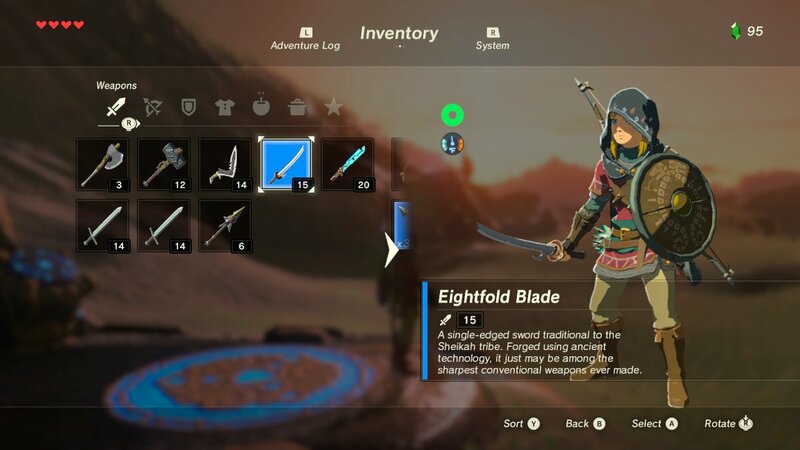 At the expense of turning this into a laundry list of the things that make Breath of the Wild great, here’s a few of the things that make Breath of the Wild great. The first, and most important facet of Breath is the internal logic the entire game operates on. Every system was designed so precisely, so intricately, that they fit together in a way that seems much simpler than it really is. For example, the weather system in this game, while perhaps not as dynamic as say, Skyrim‘s, it is unquestionably more involved. It truly changes the game and how you play it. When it rains, you can’t climb on vertical rock faces, which is as logical and simple to understand as it is strangely restrictive. Also, the rain makes it impossible to cook on an open fire that isn’t covered. Lightning strikes are not only common, they are awe inspiring. Each one leaves a little circle of fire in the grass where it lands. Each one is deadly to anyone wearing or using metal items. Swimming (which uses the same stamina wheel as climbing) is faster when you aren’t wearing bulky armor. On the whole, the game looks as good as anything I’ve ever played, despite the textures being just okay. It’s the way the grass sways in the breeze, the way colorful-looking flames sputter out in the wind or the rain. The way the sun dapples off the clouds and spreads out over the world, ripe for the exploring. It’s got Wind Waker‘s charm and Skyward Sword‘s expressionism. It readily recalls the works of Studio Ghibli, Japan’s Disney. It is, quite simply, the most dynamic, breathtaking and wonderful looking game world ever created. There’s just a little bit of Team Ico’s games here, and that goes a long, long way for me. It’s like anything anyone ever wished they could do while playing a game was thought up and successfully woven into this game’s tapestry by the developers. Fighting the skeletal Stalfos or Lizalfos enemies that piece themselves back together during fights? When they fall apart, simply pick up their heads and throw them off a cliff. Better yet, grab one of their arms to use as a weapon. The combat system in general follows this same principle of form following function, long one of Nintendo’s core principles. Yes, it’s true that your weapons break after use. It’s also true that every weapon is usable. Any physical item any characters interact with can be used. In the stores, foodstuffs don’t exist in a conceptual menu, they’re sitting right there on a table for you to buy. If you buy all the ones that are on the table, the stock is gone and you have to wait for it to be replenished. If you come across a deadened campfire, simply taking out a piece of flint and striking with a metal edge will create fire. If you’re on a sailboat but there’s no wind, swinging a giant leaf like a weapon will create enough flow to thrust you forward. It’s this simple, 1 + 1 = 2 logic that this game follows (which most games don’t or can’t) that gives it this unique game language. Learning it is as simple as breathing. Mastering it is quite another. Combat is easily at a series high. 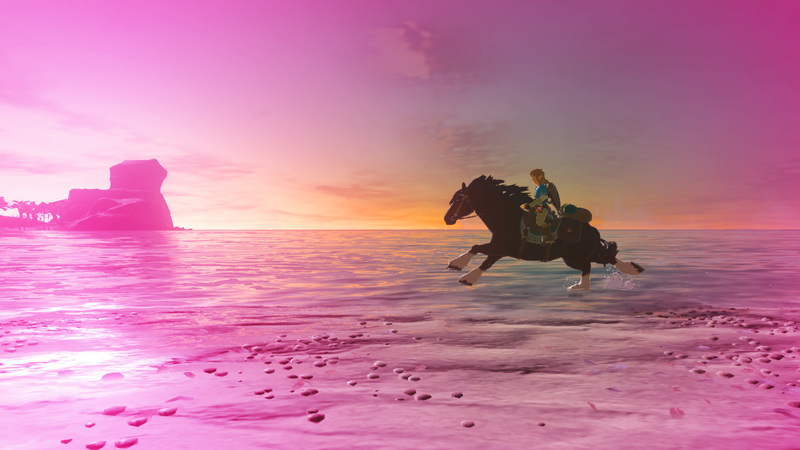 The speed and adaptability of Wind Waker mixed with the specialization and precision of Twilight Princess. 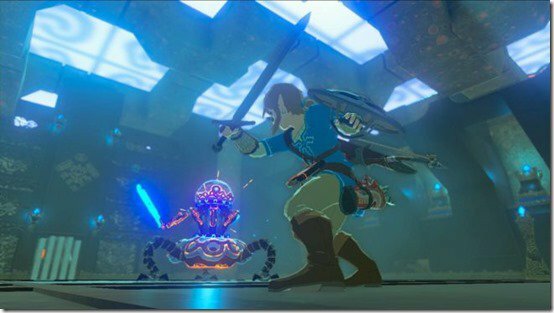 Take the combat system, finally unleashed again without the need for the awkward motion controls of Twilight Princess and Skyward Sword. At its core, it’s just jumping, blocking and attacking, but add in the variables of weather, weapon (and weapon degradation), range, sight lines, movement, elevation, and this game’s set of powers, and it becomes and almost limitless source of immersive, emergent fun. One of my best encounters thus far came whilst running through a small canyon and trying to escape a thunderstorm. Rounding a corner, I came upon two Lizalfos hiding in a hut. They, being stupid, attacked me, ignorant of the dangers of using metal weapons in a storm. Sure enough, a bolt of lightning shot down from the heavens just as one of them threw his spear at me, igniting both himself and the weapon in wrathful flame. I jumped out of the way and hid atop a rock as both my enemies, their hut and most of the surrounding grass was immolated, the fire whipped into a frenzy by the howling winds (there has never been a game with such expressive, dynamic and uncontrollable fire before). 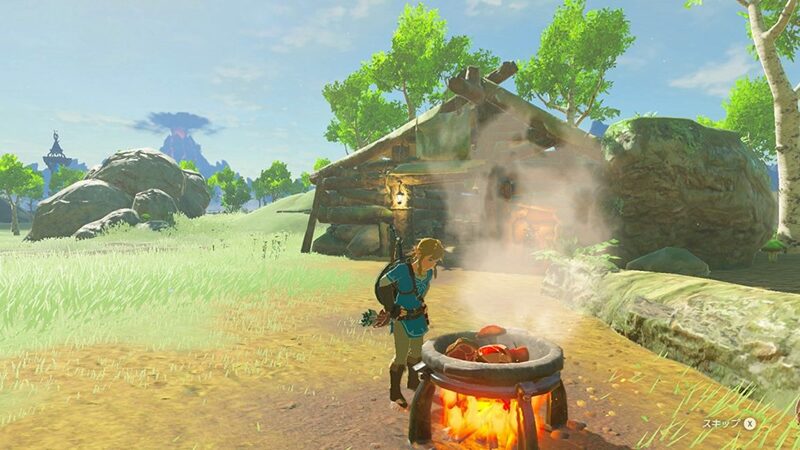 Cooking, with it’s sprightly jingles and emphasis on experimentation, is one of this game’s simple joys, and the easiest way to buff Link for tough fights or tough weather. This is not only an open-world game, it’s the most open-world game. Any surface can be climbed, any building can be entered. There are no invisible walls or loading times. In one of several shifts from established open-world tropes, there’s no experience bar, no skill trees, no way to track your progression other than the experiences you have and the gear you collect. It’s almost refreshing to play an RPG that doesn’t require constant tinkering and resource management. 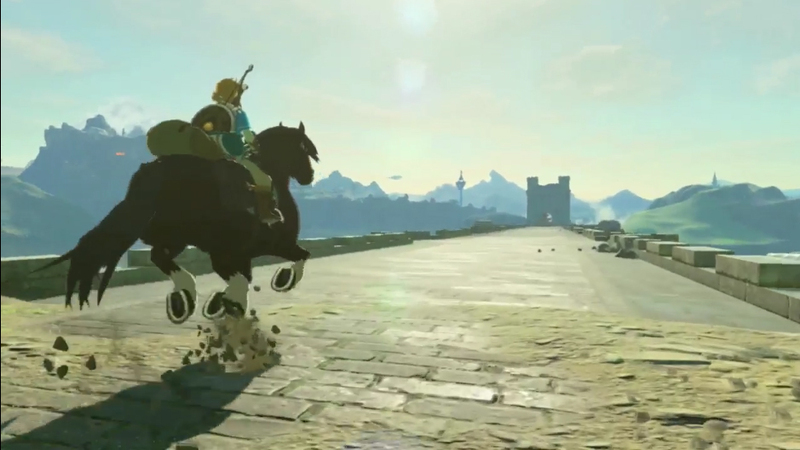 There’s no list of experiences you’ve had, no “this many horses ridden,” or “this many miles run.” The only evidence you have of Link’s travels is the gear on his back and the stories you have to tell. It’s an adventuring game, not a questing game, even if the side quests are uniformly good. The size and scope of this game world, combined with the sheer verticality, make crossing it almost imposing. There is a fast travel system, one of the few real concessions to immersion-breaking modern game design on hand. Even then, you can only travel to places your Sheikah Slate (more or less a high-tech fantasy iPad that interfaces with the shrines and dungeons of the game) has interacted with. There’s even a neat teleport animation that plays, to my knowledge the only time a developer has tried to justify fast traveling in-universe. There are no extended tutorial sequences; in fact, there are basically no tutorials outside the very basic concepts of running and jumping. The game teaches you how to play it by letting you play it. I’ve often said that Half-Life 2 is the best game I have ever played, and one of the biggest reasons for that is this sort of game-specific learning. The language of interactivity. This sort of elegant design is most prevalent in the shrines, mini dungeons that give you new loot, new spirit orbs (the only way to increase health or stamina) and most importantly, new lyrics and phrases in the unending rhythm that is Breath of the Wild. Usually, they’re just one or two simple puzzles, built around the basic functionality of one of four powers: remote bomb, cryonis (freezing water into pillars of ice), magnesis, and stasis. Shrines that focus on combat are simpler than their counterparts, but often act as barometers for how far you’re progressed. Some of these shrines combine powers, while some of them combine powers with climbing or combat. All of them deceptively simple. The answers rely less on game logic and more on real-world logic. Of course, these puzzles are expanded upon in the game’s dungeons, of which there are at least four (I’ve only just now barely started the first of the four). It’s designed to make you feel smart by solving it but not stupid for failing. Not since Portal have video game puzzles been this accommodating. Speaking of accommodation, this game achieves a balance I had previously thought impossible: it’s an incredibly challenging game that is also incredibly welcoming to play. Death strikes fast and often in Breath, but a friendly autosave system mixed with a learning curve that allows for skill and planning to overcome any foe really levels the playing field — if you know what you’re doing. It’s like an accessible Dark Souls in that way. This game does not care if you are good at it. It would prefer if you were, and it wants to help you, but the only hints on hand are ones that appear in loading screens (which you’ll only see while loading a save or fast traveling). There’s a lot of stuff in this game most players will never see. I know there are things that I will never see. That’s become almost anathema to modern game design, and understandably so. Why devote resources to something players might not see? Most games prefer not to, or at least they prefer holding the player’s hand to ensure that seeing all the content the developers worked so hard on will likely be experienced. Not Breath. Nearly the entire southern section of the map is, to my knowledge, completely inessential to the core story experience. That’s remarkably confident design in 2017. This game assumes you’ll want to see everything it has to offer. I’m honestly unsure if I’ve seen a game this ambitious handle itself so confidently. The optional content here can only be accessed by looking for it. You can’t buy a season pass that gives you a special part of the map that no one else has. There are no micro transactions or pre-order bonuses (none that matter, anyway). There are some things you can only get from Amiibos, but for the most part, they’re just cosmetic. There are those who will hate the weapon system. I am not one of them. It makes you consider and master every type of weapon in the game. Also yes, you can expand your inventory spaces. Since nearly every word of this review has been effusive, I feel at least some need to point out flaws, small and nitpicky as they may be. Easily the biggest and most likely to sour someone’s experience is the voice acting. While only a few, plot important characters receive VA (and even then only in certain cutscenes), it generally trends towards the poor side, at least in English. I think the problem is that everyone comes off as far too arch in delivery. Everyone sounds like they’re doing a voice instead of speaking. Given this is one of the first core Nintendo games to use voice acting, it’s understandable that they would be suffering through the same problems the rest of the industry did 15 years ago. Maybe the biggest problem right now is that a lot of people won’t be able to play it, due to Nintendo’s infamous supply drip and the failures of retailers like Amazon and Gamestop to secure even the base minimum of copies for the new Nintendo Switch (which seems to be the way to go as far as this game is concerned, though a Wii U version still exists**). There’s just the smallest bit of old-school modular BioWare design in how you progress the main story, and I’d almost forgotten how much I love that kind of design. Another problem is that the horses, beautiful and wondrous looking as they are, are often less practical than simply going it on foot. Breath is a highly vertical game, and horses simply can’t really go up mountains or hills. Also the controls are too imprecise, and not in that charming Fumito Ueda way where it’s an artistic statement. Also, that difficulty curve I mentioned before will certainly turn people off, as will the very concept of open-world gaming. Some players simply can’t focus themselves on beating something when they aren’t given at least some path to do so. That’s understandable. This game won’t be for everyone. In the end, that’s perhaps the most remarkable thing about Breath of the Wild. A lot of other Zelda games were great because they adhered to time-honored series tradition. This one is great almost in spite of that tradition. 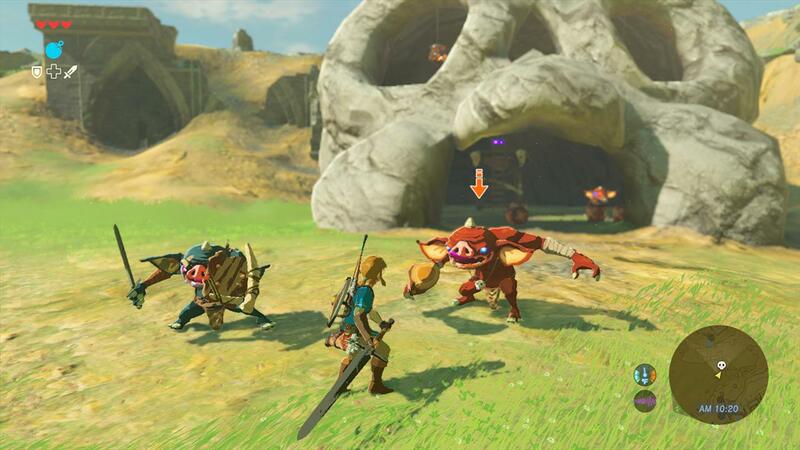 And yet, it still feels unmistakably like a Zelda game. It’s funny and whimsical in that same way, it’s light and breezy while still capable of being serious and ruminating upon some pretty advanced themes (death and rebirth are the big ones this time, and they feel particularly apt). It’s the best open world game ever created, the best immersive sim ever created, the best adventure game ever created, and most magically, the best Zelda. History has borne out how certain games change everything that comes after them. DOOM, Starcraft, and Final Fantasy VII. BioShock, Halo, Half-Life and Deus Ex. Super Mario 64, Grand Theft Auto III and Metal Gear Solid. Perhaps most importantly, the original Legend of Zelda. These games, and select few others, are touchstones and monoliths in the industry. If there’s anything I know for sure about Breath of the Wild, it’s that it is one of these games. The only thing that remains to be seen from now until some time in the next few weeks or months when I finally finish it is whether or not it’s the best of them. That it has a real chance to be excites me beyond all measure.